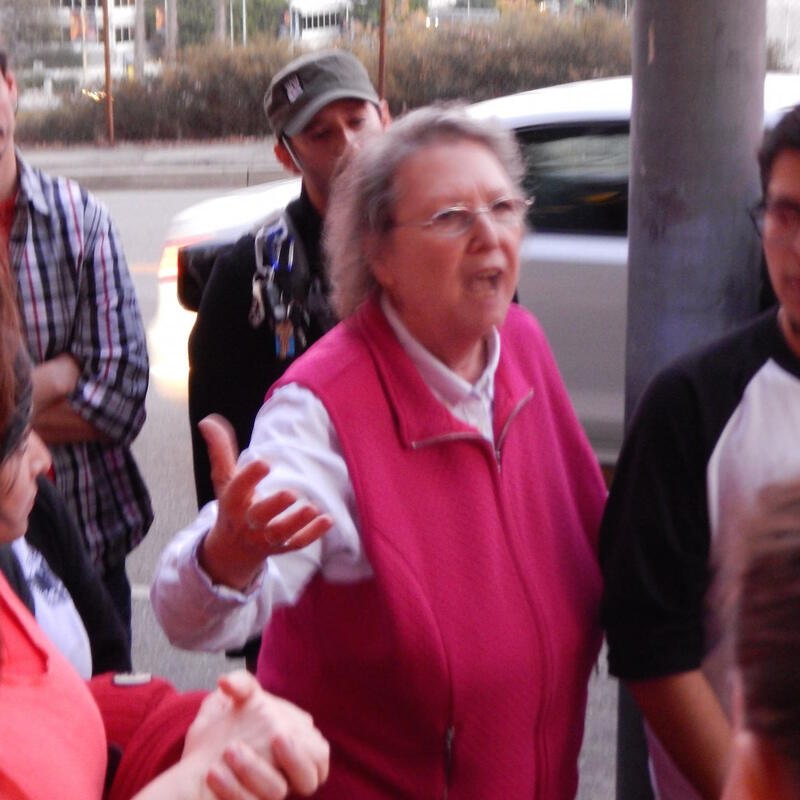 Jackie Goldberg declares war outside the school board meeting. The Broad Foundation plan to expand charter schools in LA Unified made an ominous debut before the LA Unified board yesterday as one opponent after another ripped into it as unwanted, unnecessary and destructive to the district and public education in general. The widespread attack came in several forms after the board postponed voting on a resolution from Scott Schmerelson that would put the board on record as opposing the plan. The delay enabled the board to adjourn earlier so the members could reconvene their private discussions on finding a new superintendent. “We have been here since 8 in the morning and will be meeting until about 11 tonight, not that I’m asking you to have sympathy,” said school board president Steve Zimmer, explaining to the audience why some resolutions were being delayed. Those remarks echoed much of what transpired inside the building, where one of the first orders of business was nine union leaders representing employees of the district, standing together and telling the board, “we affirm out commitment to the resolution,” as Juan Flecha, president the administrators union, put it. The group included Alex Caputo-Pearl, president of the teachers union, UTLA, which has emerged as the staunchest opposition group to the GPSN plan. Later, the board granted Schmerelson 10 minutes for a parade of supporters to speak, starting with several students from Roosevelt High School, who referred to the “Broad-Walmart plan,” a sure sign that their remarks were scripted by UTLA, the only group that consistently describes the effort in those terms. Speaking to LA School Report earlier today, Zimmer said the resolution supporters were allowed to address the board as a compromise because they were upset the resolution had been postponed. The compromise also served the board in another way: It limited discussion on what is perhaps the most volatile issue facing the district at a time it is moving closer to identifying finalists for the superintendent job — and sparing any of the candidates from seeing the divisiveness that awaits. Left to defend the GPSN plan and charters, in general, was a group of parents and students who had gathered outside for a rally outside the district building to call attention to how they benefitted from charter schools. The pro-charter rally was organized by the California Charter Schools Association, which has received funding from the Broad Foundation. Several other agenda items were postponed, including one from Mónica Ratliff that called for more transparency in the operations of charter schools. But they didn’t draw any objections. 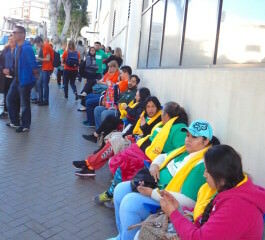 Charter school supporters lined up four hours early for the school board meeting. Somehow, the board found time to approve renewals for eight charter schools although Schmerelson opposed approval for Alliance schools over a recent court order instructing the chain to stop interfering with UTLA’s effort to unionize the teachers. “I cannot support Alliance charters for five years,” Schmerelson said, suggesting that renewals could be granted for a shorter period. That notion was quickly shot down by a district lawyer who told him state law provides only for five-year renewals. For all the theatrics of the on-going charter war and the evidence of battle lines drawn, state law precludes the board from doing much more than what the Schmerelson measure contemplates: a symbolic pronouncement. Charter petitions can be denied for many things, including questionable management and finances, but not for overall dislike. * Updated to include statement from Great Public Schools Now.